Re-imagine democratic decision-making with a “landscape approach” that includes individuals with diverse backgrounds and occupations to generate the best policies for a community – participants need not be an elected member of government to voice their interests and be heard! Paternalism – behavior or practices that disregard a person’s or group’s autonomy based on the belief that the decision-maker knows better – and its legacies often dominate national and international policy spheres. Certain people (those with power) are designated with the authority, with the voice, to make policies that other people must live by, but are often out of touch with realities on the ground and cannot possibly represent all interests fully or equally. 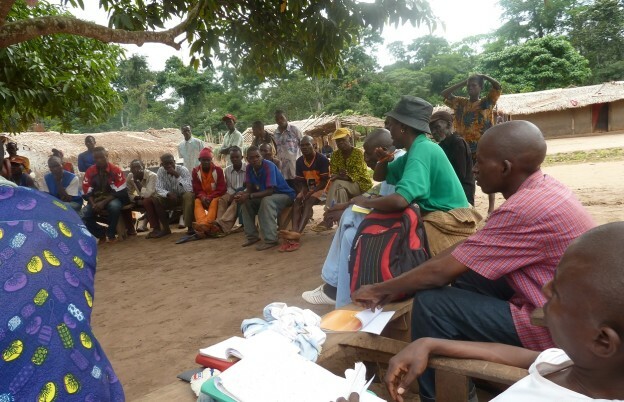 So, participation of diverse stakeholders, including farmers, business people, non-profit organizations, youth, etc., in policy creation becomes a crucial ingredient for successful governance, specifically within forest communities. A recent article by CIFOR discusses a “landscape approach” to environmental management that re-imagines typical power dynamics. This approach identifies the many individuals, groups and interests that all live, work and interact within a geographic location and gives them voice in establishing a balance amongst competing demands for water, food, income, and biodiversity. Jean-Christophe Castella, a researcher with the Institut de Recherche pour le Développement, uses “PLUP Fiction” (Participatory Land Use Planning), a kind of landscape approach, to engage Laotian villagers. Using a 3D map, villagers act out different community roles to learn how varying aspects of the community function together to better understand the impacts of decisions from often competing standpoints. Information is shared between NGOs, local governments, businesses and citizens so that everyone has equal knowledge from which to generate well-informed opinions. Literally sitting (or, in the PLUP scenario, standing and moving around) at the table where ideas and interests are shared and solutions are developed lays the foundation for healthy communication. Terry Sunderland, principle scientist at CIFOR, notes, though, that with a landscape approach, “there can never be a single ‘best’ outcome [because] interventions are always a process of constant negotiation and straightforward concepts of success or failure become ambiguous when someone’s gain is someone else’s loss.” In this way, PLUP and landscape approaches rest on the assumption that participants have empathy. Participants must not only step outside of their actual roles and be vulnerable to feel the realities of another, but must then translate their experience into decisions that are good for the community, even if they are not immediately good for themselves. Empathy is a skill and an active process that when cultivated in decision-making can lead to the most effective plans. Landscape approaches require patience, time and adaptation from all participants and stakeholders. This decision-making structure seems to breed sustainability as it assumes and accounts for change, challenges and only functions when community members engage and interact.